For sale. $ with full pedigree. Sold to Lori McAllister of Ravenwood Bunnies. 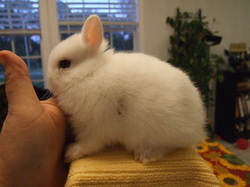 Ear length: at 3 months of age, 1 3/4"
Sold to Lori McAllister of Ravenwood Bunnies in Griffin, GA. 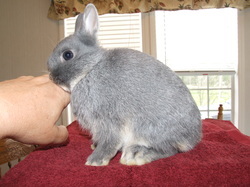 Ear length: at 8 wks of age, 2"
Sold to Lori McAllister of Ravenwoods Bunnies in Griffin, GA. Ear length: at 8 weeks of age, 2 1/4"
Picture taken: at 8 weeks of age on 2/3/13.